The main room of the house was used for dances, parties and wedding receptions of family members. The step-through windows in the room allowed for guests to move outside to a long side porch. 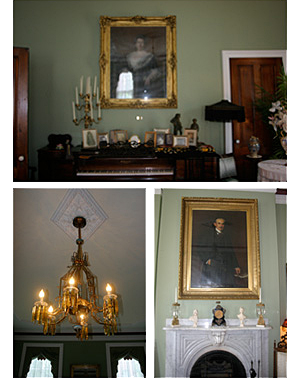 Two large portraits of Governor and Mrs. Lloyd Lowndes, the only governor from Allegany County, painted by Maryland artist Thomas Cromwell Corner are exhibited in the room. One of the interesting features of the room is the Oriental chandelier. Today, the room is used for special event teas.